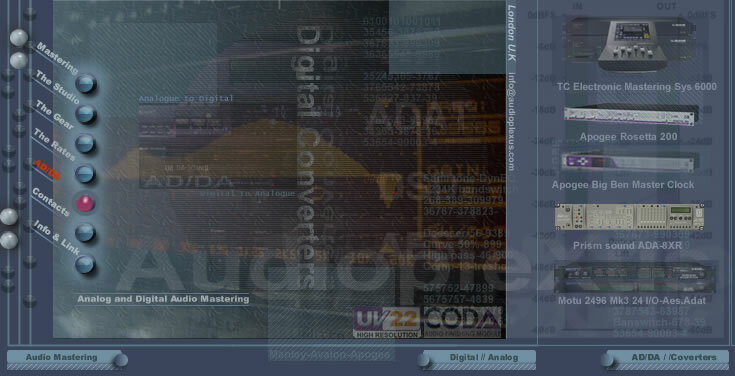 CD mastering,AudiopleXus,State of the art audio Mastering studio London. APOGEE Big Ben a Cure for the Jitters – Apogee’s new “C777” Clock. ALF maximizes BIG BEN’s clocking ability with an intelligent low pass filter. Because the C777 has made all incoming signals into data (1’s and 0’s) BIG BEN is able to dynamically compensate for excessive jitter and even improve already acceptable clock signals to levels unattainable until now. No matter what your input looks like, ALF can adapt and overcome all obstacles to create a stable, reliable, low jitter clock source. So, BIG BEN is masterfully handling external clock signals and all of their anomalies and you’ve got your jitters under control. What if BIG BEN encounters the ultimate disturbance in clocking, a dropped signal? Not to worry, with “SureLock” BIG BEN will compensate by remaining locked on the last relevant frequency sent by the delinquent device. When the signal resumes, BIG BEN will gradually, and smoothly re-synchronize without interruption. At the consumer level there are basically 2 formats for the transmission of digital audio signals (and here I am talking about the physical connections not the format of the digital data being transmitted), coaxial or electrical, using an RCA-type jack and plug (or sometimes a BNC bayonet connector) and a shielded, 75 ohm impedance, cable and Toslink or optical, which transmits the digital data in the form of light down a plastic fiber-optic cable. The Toslink system was originally developed by Toshiba, hence the name. Coaxial cable is also widely used for RF transmissions to avoid signal contamination and was originally developed for carrying colour television signals from aerial (antenna) to television. Both of these connection formats fall, somewhat confusingly, under the wider description of S/PDIF (otherwise S/P-DIF, or S/P DIF) connections, short for Sony/Philips Digital Interface Format, a jointly developed standard for the transmission of digital signals between equipment (IEC-958 defines the standard). The image to the right shows the rear panel of a standard DVD player, complete with a choice of coaxial or Toslink S/P-DIF outputs. MOTU For the computer-based mastering studio, the included PCI-424 card features CueMix DSP™, a flexible DSP-driven mixing and monitoring matrix that eliminates the need for an external mixer or patch-bay. Connect all of your studio gear, including synths, keyboards, and even effects processors. Then control it all from your desktop with no audible monitoring latency and no processor drain on your computer. With 24 channels of digital I/O, the 2408 is ideal for connecting your computer to a digital mixer. Both ADAT lightpipe and Tascam TDIF digital connections are supported at any sample rate up to 96kHz.The MOTU Audio 24I/O interface fulfills the promise of host-based hard disk recording: to record, edit, mix process, and master multitrack recording projects entirely inside the computer. It provides 24 high quality, 24-bit/96kHz analog inputs and outputs in a cost effective, single rack space package, allowing you to connect and record from 24 simultaneous analog sources. Performance specifications for digital-to-analog converter chips include resolution, settling time, differential nonlinearity (DNL), integral nonlinearity (INL), power dissipation, reference access, and special features. Resolution measures the number of discrete levels used to represent a signal and is usually defined in bits. Settling time is the time required for an output to approach a final value within the limits of a defined error band. The DNL error is the difference between the ideal and measured output values for successive DAC codes. The INL error is the amount that a measured transfer function deviates from an ideal transfer function as defined in a straight line drawn from zero to full scale. Power dissipation is the maximum number of watts that the device dissipates. Reference access indicates whether the voltage reference is an internal power supply, or the user supplies the voltage reference. Special features include rail-to-rail outputs, single supply, and on-chip electrostatic discharge (ESD) protection.Digital-to-analog converter chips are available in a variety of integrated circuit (IC) package types. Basic types include ball grid array (BGA), quad flat package (QFP), single in-line package (SIP), and dual in-line package (DIP). Many packaging variants are available. For example, BGA variants include plastic-ball grid array (PBGA) and tape-ball grid array (TBGA). QFP variants include low-profile quad flat package (LQFP) and thin quad flat package (TQFP). DIPs are available in either ceramic (CDIP) or plastic (PDIP). Other IC package types for digital-to-analog converter chips include small outline package (SOP), thin small outline package (TSOP), and shrink small outline package (SSOP). Audio Convertion Digital-to-analog converter chips (DACs) transform information from digital to analog form. They convert signals that have two defined states, on and off, into signals that have a theoretically infinite number of states. For example, modems convert digital computer data that consists of ones and zeroes into audio frequency (AF) tones that can be transmitted over telephone lines. Digital-to-analog converter chips are also used in digital signal processing to improve the intelligibility and fidelity of analog signals. First, analog-to-digital converter chips (ADCs) are used to convert analog signals into digital form. Next, special circuitry is used to improve these signals. Finally, digital-to-analog converter chips are used to transform the digital impulses back into analog form.There are several architectures for digital-to-analog converter chips. Some DACs use a resistive ladder network (R2R) in which each segment consists of two resistors: one with a value of R and one with a value of 2R. Other DACs include a string of resistors, each of which has a value of R. Current steering is an architecture that uses an internal current source to deliver the output current. Sigma-delta architecture takes a fundamentally different approach. In their most basic form, sigma-delta converters consist of an integrator, a comparator, and a single-bit DAC. The output of the digital-to-analog converter is subtracted from the input signal. The resulting signal is integrated, and the output voltage is converted to a single-bit digital output by the comparator. The resulting bit becomes the input to the DAC, and the output is subtracted from the input signal.. There are other connection formats usually found on professional gear, but sometimes seen on "higher-end" consumer gear: the AES/EBU, a standardised format for digital transmission developed jointly by the Audio Engineering Society and the European Broadcasting Union and defined by standard IEC-958, which uses a 3 pin, balanced XLR-type connector and 3 conductor, 110 ohm impedance cable; multi-mode AT&T or ST-Glass (pictured left), and single mode laserlinque (a proprietary format developed by Theta Digital, I believe) both using a locking bayonet connector and a glass fiber-optic cable.